Just a quick note before I head out this morning for San Diego. 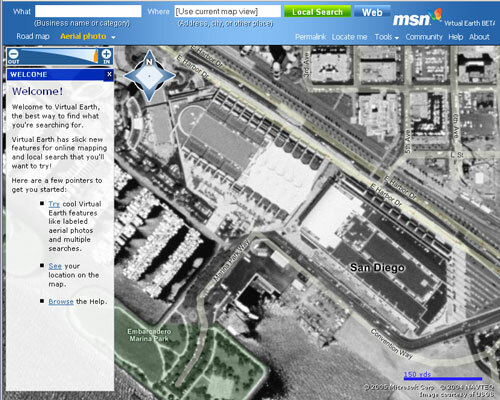 MSN Virtual Earth is up and running. Looks like they are using the Terraserver images in the background and some more up to date aerials in the urban areas. That works much nicer than those low-res satellite images that Google has and you can zoom in much closer than Google Maps can. The transparency on the toolbar and search is nice as you can see the data layers underneath. I’m quite impressed with it and I think it looks much better than Google Maps to the eye. I might change my mind after using it, but I’ll try it more tonight. Robert Scoble says that there will be an announcement Monday morning while we are listening to Jack Dangermond. Guess we’ll have to take advantage of the wireless network to find out what they say about MSN Virtual Earth. [Update] - Check out this comparison between Google Maps and MSN Virtual Earth.